Learn more about PAR’s privacy and legal policies. 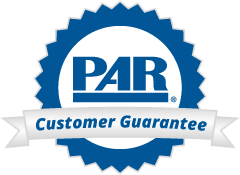 PAR's website is PCI compliant. We're proud to provide our Customers with a secure, safe space to process their credit card orders. All systems are hosted at a Peak 10 data center that is centrally located to our U.S. Customer base. For more information on the security credentials of this data center, visit this page.